Fuller says, the latter: Dugdale the former, from his arms on one of the windows in Gray’s-inn-uall. Orig. Ju risdic. 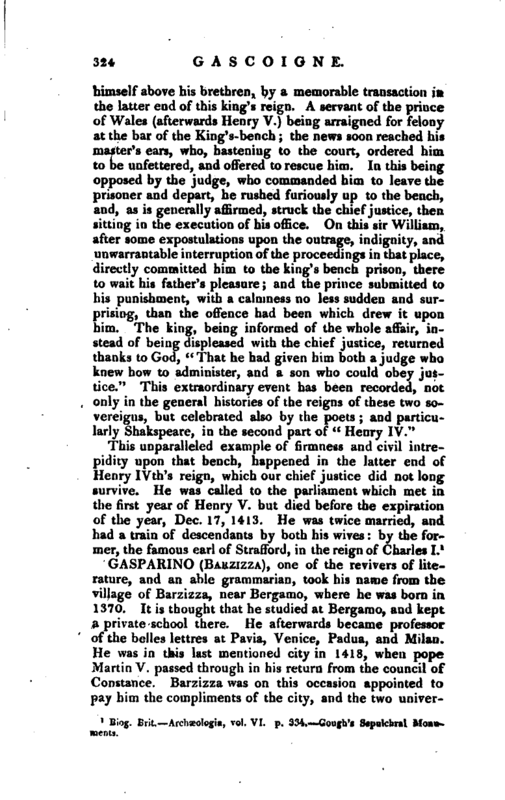 p. 308, edit 1671, folio. The arras are, Argent, on a pale Sable, A demy-luce Or. 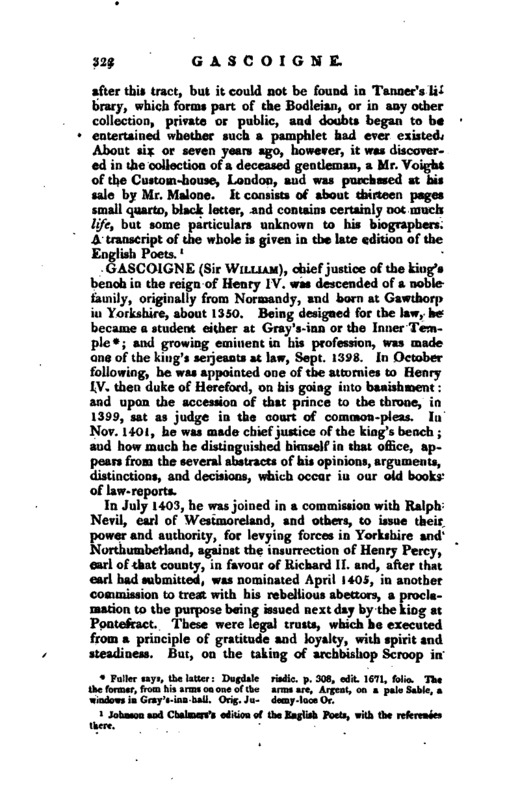 and growing eminent in his profession, was made one of the king’s Serjeants at law, Sept. 1398. In October following, he was appointed one of the attornies to Henry IV. then duke of Hereford, on his going into banishment: and upon the accession of that prince to the throne, in 1399, sat as judge in the court of common-pleas. In Nov. 1401, he was made chief justice of the king’s bench; and how much he distinguished himself in that office, appears from the several abstracts of his opinions, arguments, distinctions, and decisions, which occur in our old hooks of law-reports. In July 1403, he was joined in a commission with Ralph Nevil, earl of Westmoreland, and others, to issue their power and authority, for levying forces in Yorkshire and Northumberland, against the insurrection of Henry Percy, earl of that county, in favour of Richard II. and, after that earl had submitted, was nominated April 1405, in another commission to treat with his rebellious abettors, a proclamation to the purpose being issued next day by the king at Pontefract. These were legal trusts, which he executed from a principle of gratitude and loyalty, with spirit and steadiness. But, on the taking of archbishop Scroop in | arms the same year, when the king required him to pass sentence upon that prelate as a traitor, in his manor-house at Bishopthorp near York, no prospect of fear or favour was able to corrupt him to any such violation of the subjects’ rights, or infringement of those laws, which suffered no religious person to be brought to a secular or lay trial, unless he were a heretic, and first degraded by the church. 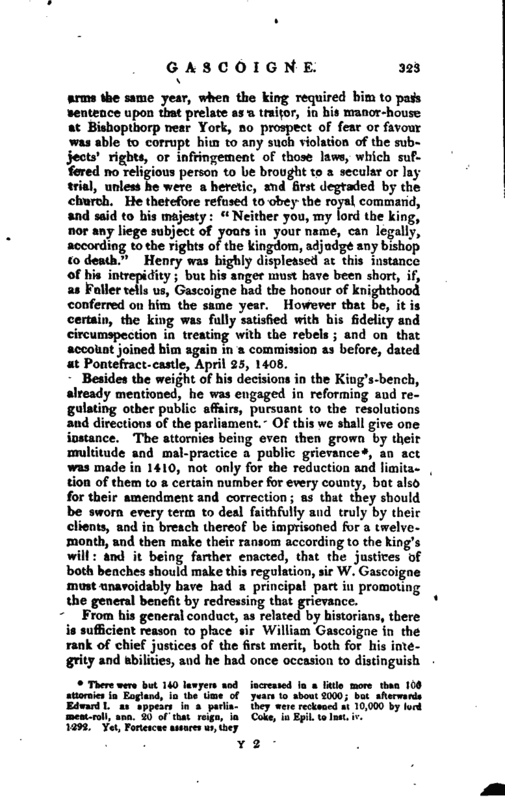 He therefore refused to obey the royal command, and said to his majesty: “Neither you, my lord the king, nor any liege subject of yours in your name, can legally, according to the rights of the kingdom, adjudge any bishop to death.” Henry was highly displeased at this instance of his intrepidity; but his anger must have been short, if, as Fuller tells us, Gascoigne had the honour of knighthood conferred on him the same year. However that be, it is certain, the king was fully satisfied with his fidelity and circumspection in treating with the rebels; and on that account joined him again in a commission as before, dated at Pontefract- castle, April 25, 1408. Besides the weight of his decisions in the King’s-bench, already mentioned, he was engaged in reforming and regulating other public affairs, pursuant to the resolutions and directions of the parliament. Of this we shall give one instance. The attornies being even then grown by their multitude and mal-practice a public grievance*, an act was made in 1410, not only for the reduction and limitation of them to a certain number for every county, but also for their amendment and correction; as that they should be sworn every terra to deal faithfully and truly by their clients, and in breach thereof be imprisoned for a twelvemonth, and then make their ransom according to the king’s will: and it being farther enacted, that the justices of both benches should make this regulation, sir W. Gascoigne must unavoidably have had a principal part in promoting; the general benefit by redressing that grievance. There were but 140 lawyers and attornies in England, in the time of Edward I. as appears in a "parliament-roll, ann. 20 of that reign, in 1292. Yet, Forteacue assures us, they increased in a little more than 100 years to about 2000; but afterwards they were reckoned at 10,000 by lord Coke, in Epil. to lnst iv. Biog. Brit. Archæologia. vol. VI. p. 234.—Gough’s Sepulchral Monuments.